Slender spikes of bright yellow flowers appear from November to March, above rosettes of large, handsome, dark green, holly-like leaves. The flowers of this lovely, upright, evergreen shrub have a fragrance reminiscent of lily-of-the-valley, and seem to glow in the wintry sunlight. They are followed by bunches of highly ornamental, round, deep purple berries. 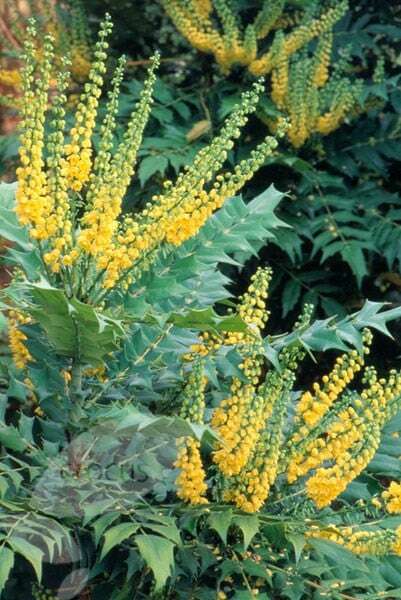 This mahonia makes a lovely focal point for a shady spot in the garden, where its glossy, architectural leaves can be appreciated all year round. Give it space, as its leaves will spread, and conceal its long 'legs' with spring-flowering bulbs and small, shade-loving perennials. 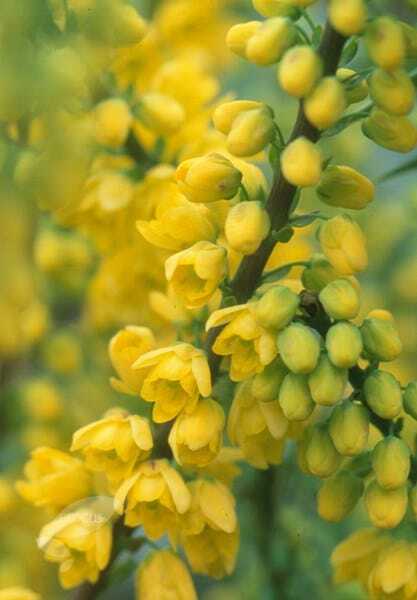 Although it prefers shade, it will tolerate sun as long as the soil remains moist. Winter Sun Mahonia - Well named. I have had two of these bought some years ago and planted directly in my garden and they have thrived and look and smell beautiful. A focal point - much admired. I bought two more from Crocus to plant in pots on my daughter's paved patio where there is no soil at all - or so I thought! I obviously planted in pots that were too small. I lost one but the other 'took off' 'and forced its way through the base of the medium sized terracotta pot. I had to break the pot to get it out but it's now happy in a very large pot. This hardy, intrepid beauty is true to its name, brightening up the dark days. A real winner if planted in the right place and tended with care if in a pot. The plant was re-potted after purchase nearly one year ago and is still very healthy and attractive. Great plant for shade. Flowered in first year and put on lots of new growth. I bought another I liked it so much and seems to like it's aspect. South facing garden, part shade, free draining soil that's kept moist. A lovely plant. Give it its head if you have space. Otherwise clip its wings. Provided cheerful presence in the winter garden. I planted it in a corner and as promised, it performed well especially during winter, providing yellow sunny colour and dark glossy architectural leaves.